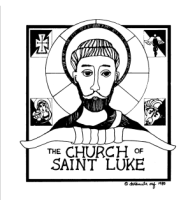 Sunday Masses at St. Luke are at 5:00 PM on Saturdays (anticipatory Mass of Sunday) and at 9:00 AM and 11:30 AM on Sundays. Daily Masses are at 7:30 AM on Wednesdays, Thursdays and Fridays. There are no Masses on Monday, Tuesday, or Saturday mornings. Holy Days of Obligation Masses are normally at 7:30 AM and 6:00 PM. Check the Parish Calendar for specific days. The Sacrament of Reconciliation is offered every Saturday beginning at 3:30 PM. You may also celebrate the sacrament by making an appointment through the Parish Office. If Father Ron is available, he will hear Confessions at any time.